Food lodgement occurs when food particles stick to the teeth after having a meal and do not rinse off easily. It gives a gritty sensation between the teeth or irritation in the gums. Why does food lodge between the teeth? Food gets lodged between teeth for two main reasons – dental cavities and advanced gum disease. With dental cavities, food usually gets stuck at the same place repetitively. In advanced gum diseases, there is a loss of the bone surrounding the teeth, which creates spaces between the teeth results in food getting lodged. What is the solution to food lodgement? Filling dental cavities with dental filling materials are the best option to reduce, or rather avoid food lodgement to occur. In cases where the cavities are deep, there may be a requirement for a Root canal treatment (RCT) to be done. 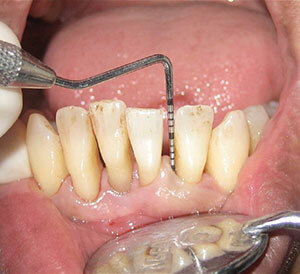 Gum diseases would require procedures to prevent further progression of the disease. Although gums that have already been lost usually do not grow back again. However, with surgical gum treatments and artificial bone grafts, food lodgement can be reduced and avoided.